Nikkei Manufacturing PMI Flash and Leading Economic Index have been published in Japan and the US will release New Home Sales data. The support rests at 112.090 with resistance at 112.860 which the weekly pivot point at 112.290 is located in between the lines. 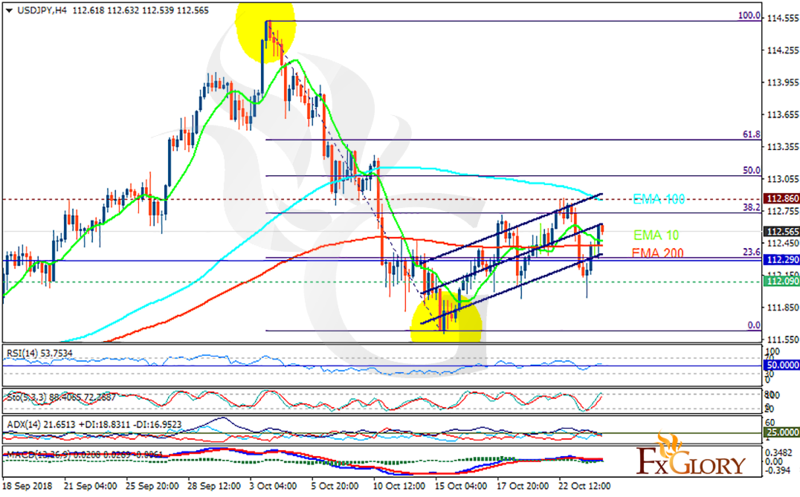 The EMA of 10 is moving with bearish bias in the ascendant channel and it is below the EMA of 100 and above the EMA of 200. The RSI is moving above the 50 level, the Stochastic is moving in high ranges and the MACD line is below the signal line in the negative territory. The ADX is not showing any clear signals. The resistance line seems to be too strong to be broken therefore short positions are recommended towards 111.7.